The bank, which is hoping to break even at the end of this fiscal year, has taken a series of measures to bring down NPA level. The bank has started seven stress asset management branches in the country with instructions to recover NPA above Rs 5 crore . 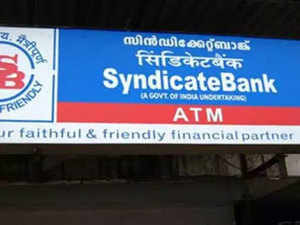 KOCHI: Syndicate Bank has hinted that the spate of farm loan waivers by several states in the recent times may challenge its efforts to reduce NPA . The bank, which is hoping to break even at the end of this fiscal year, has taken a series of measures to bring down NPA level. " We expect to reduce net NPA from 6.9% to below 6 and the gross NPA from 12.9% to below 12 at the end of the year,’’ said S Krishnan, executive director of the bank. The bank has sizeable NPA exposure in corporate and agriculture sectors. "The farm loan waiver is a matter of concern for us and could make recovery difficult, ‘’ he said adding that it wouldn’t hit the bank recovery measures. The bank has started seven stress asset management branches in the country with instructions to recover NPA above Rs 5 crore . The stress asset management branch usually deal with NPA of Rs 50 crore and above. The bank is expecting a growth of 3 to 5% in the current year. " We hope to move into the major bank category in the next six months by taking our total business to Rs 5 lakh crore,’’ Krishnan said. The bank recently proposed to raise Rs 500 crore by issuing stock to its members under the ESPS scheme. It is also looking at other avenues like rights and bond issues to raise capital. `` Our capital is adequate for the current needs. But we need capital for growth in future,’’ he said. Krishnan was in Kochi as part of series of employee town hall meetings to educate them about the latest developments in banking.